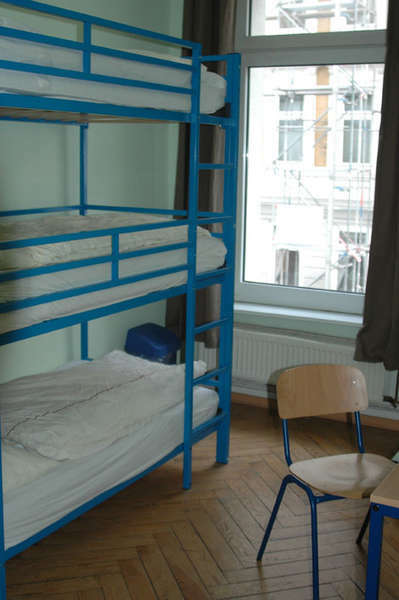 Our hostel is located in St. Pauli and prides itself on its charming atmosphere. 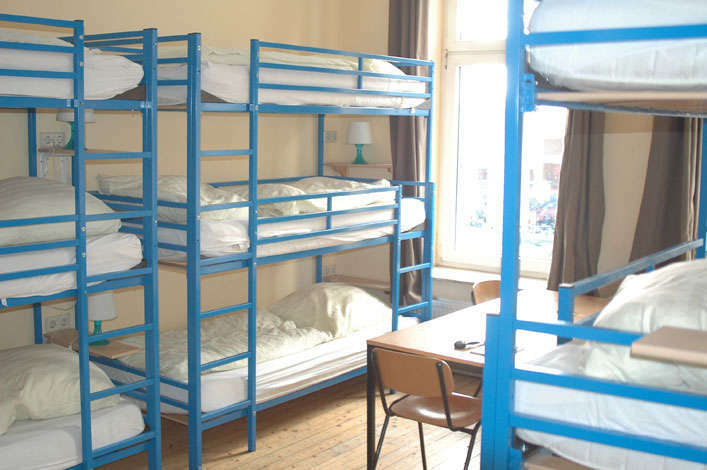 We have 72 beds in a total of 16 rooms. 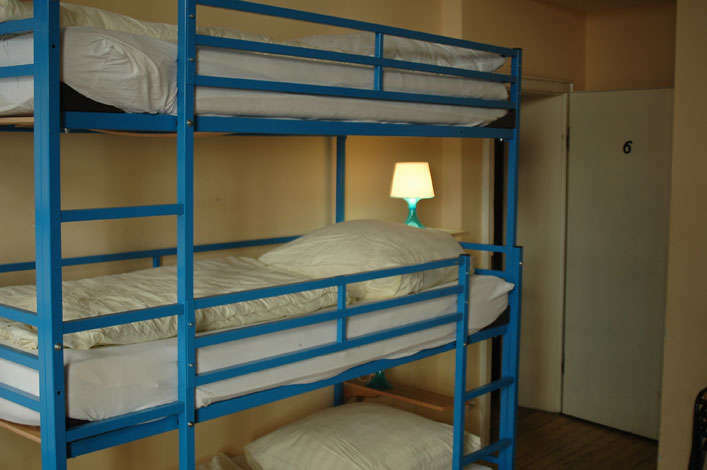 We offer both single beds in mixed 4-bed rooms and private rooms of different sizes. We have rooms for 2, 3, 4, 5 and 9 people. Each room has a private bathroom with toilet and shower - either directly in the room or just a few steps down the hall. In addition, each room is equipped with a television and a refrigerator. When you arrive, the beds are freshly made for you. Towels, soap and a hair dryer must be brought. In our community kitchen there is everything you need in order to cater for you during your stay. The food can be bought in the supermarkets, which are easily accessible from the hostel on foot. Generally, you can rach many attractions by a short walk from the hostel. To the “Landungsbrücken” or the “Michel” it's leisurely 10 minutes, the sceney “Schanzenviertel” and the “Karoviertel” you reach in about 15 minutes. If you want to see places a bit further away, there are two subway stops around the corner – you can be the city in 10 minutes or in just half an hour at the airport. Our staff has answers for all your questions about your Hamburg trip. We have lots of tips to ensure that you get to know Hamburg's most beautiful corners and get to see much of our enchanting city! The B4 passes the Detlev-Bremer-Straße in a distance of ca. 200 m. Coming from south or east you get through the A1 and the A255 to the B4. Follow the B4/Ost-West-Straße for ca. 2,5 km. Keep to the right at the Millerntorplatz, following the B4. Turn left into the Simon-von-Utrecht-Straße after 180 m. After 300 m you turn left into the Detlev-Bremer-Straße. Our hostel can be found on the right side. Coming from the A7 you can reach the B4 through the exit Hamburg-Stellingen. Drive off to the right to the Kieler Straße in the direction of Hamburg-Stellingen/B4/B5. Turn right into the Kieler Straße in the direction of Hamburg after 420 m. Turn left into B4/Stresemannstraße after ca. 4 km in Hamburg. Turn right into the Detlev-Bremer-Straße after ca. 2 km. After 270 m you reach our hostel. If you get to us by train or bus, you can either take the U3 (Station "St.Pauli") or the S1/S2/S3 (Station "Reeperbahn"). Both trains leave from central station, which is also very close to the central bus station. From both stops it is a 5 minutes walk to our hostel. From the airport you can easiliy reach us by train. Just take the train S1 directly at the airport. Get out of the train at the station "Reeperbahn". It takes you about 30 minutes. From the station "Reeperbahn" it's a 5 minutes walk to our hostel. Cancellations of reservations less than 8 days before date of arrival are charged 80 %. Cancellations of reservations less than 9 weeks before date of arrival are charged 50 %. Cancellation of reservations more that 9 weeks before date of arrival are charged 25 %. In case of no-show without a cancellation 100 % are charged. The place of jurisdiction is Hamburg. Please note that the check-in is possible from 2 pm - 8 pm. Our reception opens at 11 am. You can store your luggage if your room isn't ready. At the date of departure the check-out needs to be until 11 am.